Attract patients who are actively looking for a neurologist in your local area. Build credibility by becoming a highly rated provider in your area. Stay on top of mind by leveraging your network of patients and physicians. With more people looking online to find the right neurologist for their specific needs, it’s more important than ever that you develop a results-driven neurology marketing strategy to target the right patients. While it might feel overwhelming to get your practice noticed online, it’s an opportunity to grow your patient base and stand out from other practices. At GMR Web Team, we work with you to develop the right marketing solution for your practice’s needs. Our neurology marketing professionals help you dominate local search by implementing search engine optimization (SEO) and pay-per-click (PPC) strategies to find patients searching for local neurologists online. We’ll create a mobile-friendly website and optimize it with the right keywords to ensure your site will be at the top of search results. We construct strategic PPC campaigns that deliver immediate results by directing patients right to your site. By using these two strategies together, you will attract and convert more patients than ever before. More patients will check your online review profiles before scheduling an appointment. Developing a strong online reputation builds credibility and makes your practice stand out from the rest. After all, most patients won’t see a neurologist with little or poor online reviews. 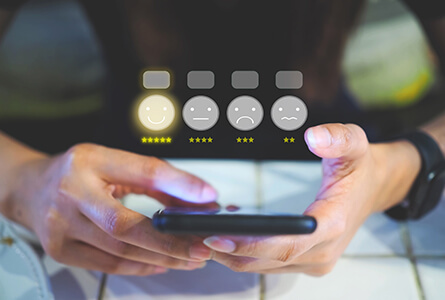 With our proprietary reputation management software, generate more genuine online reviews and receive patient feedback. Understand the patient experience so you can pinpoint problem areas and improve practice operations. Our team of neurology marketing experts helps you become a highly rated neurologist in your local area by monitoring your online reviews. We understand that obtaining referrals, whether that be from patients or physicians, is still a crucial way to grow a neurologist’s practice. That’s why our neurology marketing professionals work with you to create an extensive referral program to get the full potential out of your patient pool and physician network. We utilize email marketing campaigns and network through online social media platforms to develop a consistent online presence. We ensure that your practice stays on top of mind when it comes time to give referrals. Connect with us to improve patient acquisition rate for your neurology practice.